The Maypole is one of the traditional symbols of Beltane, and let's not kid ourselves about its purpose: it's a giant phallus. Because Beltane festivities usually kicked off the night before with a big bonfire, the Maypole celebration usually took place shortly after sunrise the next morning. This was when couples (and probably more than a few surprised triads) came staggering in from the fields, clothes in disarray and straw in their hair after a night of bonfire-inspired lustiness. 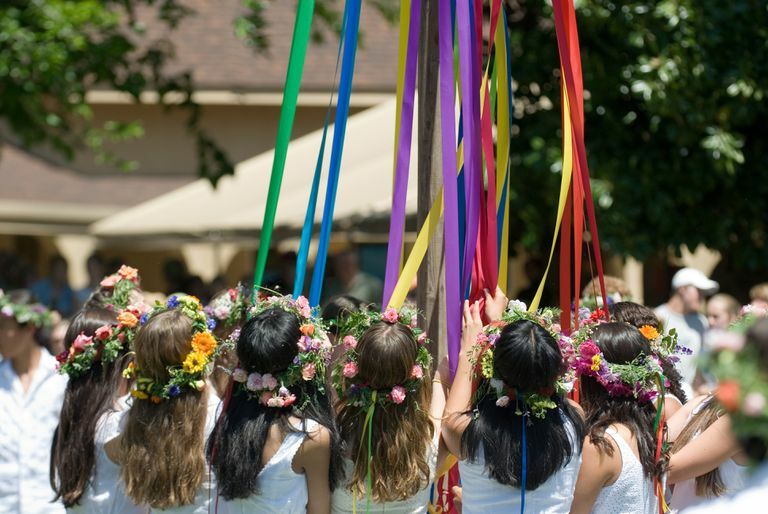 If you plan in advance, you can have a fun and exciting Maypole dance by digging a hole ahead of time, and inserting a 15-20 foot wooden pole. Invite each participant to bring their own ribbons, and attach these to the top of the pole. By the time the dance is done, the pole will be wrapped in a sheath of ribbons, and your guests will have had a wonderful time! The pole was erected on the village green or common, or even a handy field—thrust into the ground either permanently or on a temporary basis—and brightly colored ribbons attached to it. Young people came and danced around the pole, each holding the end of a ribbon. As they wove in and out, men going one way and women the other, it created a sleeve of sorts—the enveloping womb of the earth—around the pole. By the time they were done, the Maypole was nearly invisible beneath a sheath of ribbons. Ask each participant to bring their own ribbon; it should be about 20 feet long, by two to three inches wide. Once everyone arrives, attach the ribbons to one end of the pole (if you put a metal eyelet screw in the pole beforehand, it makes it a lot easier because you can just tie each ribbon to the eyelet). Have extra ribbons on hand, because inevitably someone will have forgotten theirs. "There are many variants of this dance, with each team taking a turn to move or with one team passing two of the other team before dancing around them. You can easily experiment but remember that the goal is to be able to unwind cleanly after you have used up all of the ribbons during the wind up." You may want to have a crown of flowers attached as well — put that at the top once all the ribbons are in place, but before you raise the pole.